Look, we don’t wanna blow the lid off of Santa’s game, but there are a few things about reindeer that you should probably know. First, Reindeer and Caribou are literally the same animal - historically, people who know about animals thought they were different species, but now we know that they’re not (also, fun fact: they’re the only species that can actually see ultraviolet light). The name “reindeer” has nothing to do with the reins of a sled - it’s a name from Norse origin, which is “hreinn”, for deer. Also, whoever decided to give all of Santa’s reindeer male names obviously did not know what they were talking about, since the males shed their antlers in the winter and spring, whilst the female reindeer keep theirs until summer. Which also makes sense, since the first depiction of Santa’s reindeer - in Clement C. Moore’s poem, “A Visit from Saint Nicholas” describes his reindeer as tiny…which either means they were female (who are significantly smaller than males) or were the Svalbard subspecies of reindeer, which weigh only about half as much as the average reindeer and are at least a food shorter in height. Which is very useful when landing on roofs! Also, speaking of roofs - that clicking sound? Yeah, some subspecies of reindeer have knees that actually make a clicking noise while walking, which helps them stick with their squad in a blizzard. Neat! 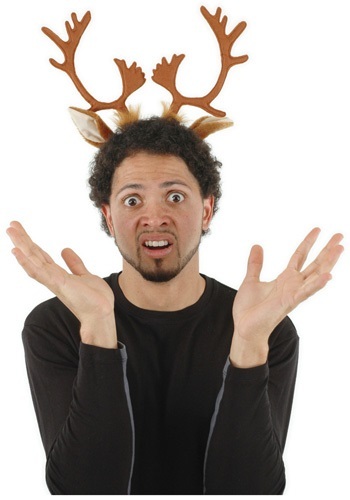 None of that really matters, though, when it comes this Reindeer Antlers Headband! All you need to care about is the fact that slipping on this brown fuzzy headband with bendable antlers will level up the holiday game of any HoJo (a.k.a., Holly Jolly Christmas-loving person)! Slip on these furry deer ears and you'll be ready to fly (geddit? Because Santa's reindeer can fly? Not in real life, though, just in case you were wondering) into the holiday spirit!